The IA Indigenous team were engaged by Indigenous Business Australia (IBA) working with Evolve FM as Project Manager to deliver their new Sydney Office. The new workplace incorporates agile and flexible workplace design that allows for future growth. 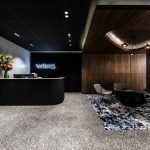 The design of the new workplace recognises that the physical workplace is symbolic of IBA’s vision of being an Indigenous business, culturally supportive, increasing connection and supporting their brand identity. 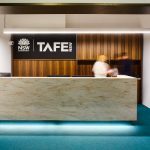 This vision drove the design palette for the space, by making reference to Indigenous history, specifically to Sydney and Goulburn through the use of colours, textures and finishes. Cultural engagement and research played a significant role in informing the design as well as the meeting room naming convention. Flexible working was prioritised with sit-to-stand motorised workstations for all staff as well as a variety of collaboration, meeting, quiet and focus spaces to support different working requirements. A further addition to the design was a customer hub which also functions as a hot desk/meeting space for IBA clients to utilise if required. IA Indigenous supported Evolve FM Project Managers to ensure this project was delivered successfully, on time and budget.